Many organizations have explicit requirements for keeping their GIS implementations up and running. They need to protect critical information assets, limit data loss, and minimize downtime during a crisis. That is why Esri’s goal with ArcGIS is to develop better ways to support business continuity and increase GIS server resiliency across all deployment patterns. ArcGIS 10.4 for Server is a more resilient platform that makes it possible to respond quickly when something goes wrong. It includes new tools and capabilities to help users protect GIS investments running on their own infrastructure. When large numbers of people require access to an IT system all at the same time, performance can slow down considerably and sites and applications can be hard to maintain. 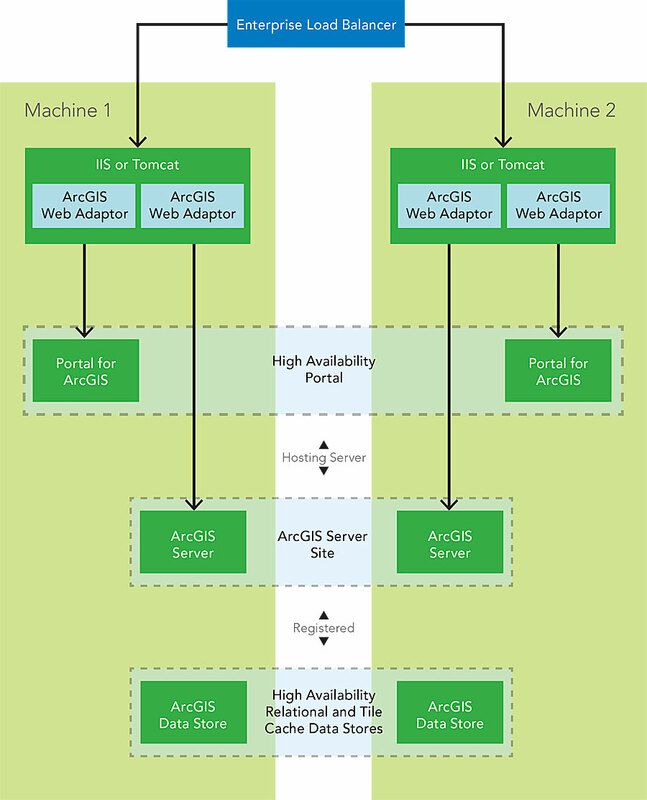 ArcGIS 10.4 for Server includes a new, simplified high-availability configuration that makes it much easier to sustain continuous operations and maintain performance during periods of peak user load. By default, sites on ArcGIS 10.4 for Server work with a load balancer—either ArcGIS Web Adaptor (which is included with ArcGIS for Server) or a third-party load balancer—to support multiple GIS servers. This high-availability experience gives administrators the capacity to detect site failures and mitigate single points of failure, minimizing downtime. To keep network chatter to a minimum, GIS server machines configured to work with an ArcGIS Server site can be organized into groups, called clusters. New and updated installations of ArcGIS 10.4 for Server default to single cluster mode. This decreases network traffic between machines, cuts back the load on the network, and improves monitoring of GIS servers in the site. Single cluster mode does not include load balancing between machines in the cluster. Customers who already use single cluster mode, as well as sites with multiple clusters from earlier releases, will have their settings preserved when upgrading. Ingesting, archiving, and displaying data just got faster too. The improved ArcGIS 10.4 GeoEvent Extension for Server now works with high-velocity and high-volume observation data via the new spatiotemporal big data store. The spatiotemporal big data store can archive high-volume observation data (including both moving objects and stationary sensors with change attributes) at a rate of tens of thousands of writes per second. It can also archive across multiple machines, or nodes. Additionally, users can visualize observation data on dynamic maps that are aggregated and rendered by the server, as well as through features queried from a feature service that is rendered on the client side. Accidental changes to GIS services can be detrimental. That is why, with ArcGIS 10.4, an ArcGIS Server site can now be set to read-only mode. When a production site is read-only, most administrative operations—including publishing new services—are disabled so any inadvertent or ad hoc changes that are made to layers and services can’t impact the applications and data that staff and customers use on a daily basis. Existing services on the site continue to function, and administrators can still add machines to the site or remove them. Beyond protecting against unintended changes, read-only mode is useful for upgrading software, since it protects against publishing new services and blocks most administrative operations. Additionally, if multimachine sites fail to connect to the underlying configuration information, read-only mode enhances the server’s ability to continue functioning. If an ArcGIS Server site or web GIS deployment goes down completely, a single tool in ArcGIS 10.4—called webgisdr—can now bring it back online quickly. The tool, which is located in the Portal for ArcGIS tools directory, allows users to back up all the related parts of a web GIS deployment—including Portal for ArcGIS, ArcGIS for Server, and ArcGIS Data Store, as well as all their items and settings—and export the whole system as a single file. Users can store the exported file in a secure place (a separate machine is the best practice) and use it to restore the ArcGIS Server site or web GIS deployment. They can also use the file to replicate the implementation on a standby deployment that can be brought online promptly if the primary deployment fails. For ArcGIS for Server users, security is generally a primary concern. ArcGIS 10.4 presents a new security option—fine-grained access control—for federated servers. With this, administrators can update a federated GIS server to control which portal members have administrative and publisher access to the server. To ensure tighter security, administrators can also now scan their organization’s portals for best security practices. A new Python script tool in Portal for ArcGIS scans for common security issues by checking for problems based on the best practices for configuring a secure portal environment. To strengthen security, many organizations require their users to regularly change their passwords and database credentials. Previously, this impacted apps that used GIS services with connections to specific databases, forcing all affected services to be republished. Now, administrators can use the ArcGIS Server Manager or ArcGIS for Desktop to put the new credentials into the data store connection file, making it unnecessary to republish the impacted services. 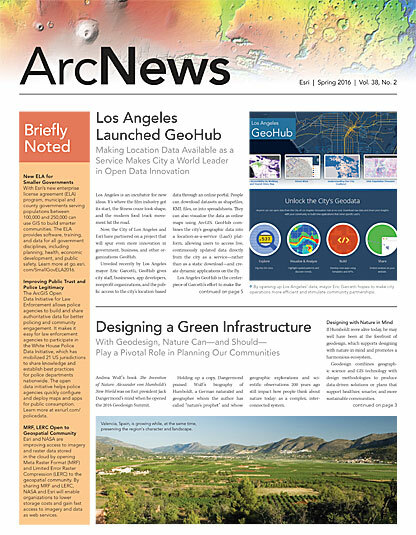 ArcGIS Pro publishers can also connect to registered data stores and share new maps and layers that directly reference the enterprise data without having to copy data or republish layers. ArcGIS 10.4 is a major step forward for customers running ArcGIS on their infrastructure. Users will find a stronger, more resilient GIS server and on-premises portal, with built-in tools to implement high-availability sites and protect deployments for better business continuity. ArcGIS 10.4 also sets the stage for specialized enterprise GIS implementations coming later in 2016. For more details on ArcGIS 10.4 for Server, visit its What’s New page. Customers can deploy ArcGIS for Server in a variety of ways, depending on their business needs. They can implement it on their own on-premises infrastructure or in third-party cloud platforms—or both. Esri provides ready-to-use images (virtual computers running in the cloud) of ArcGIS for Server on Amazon Web Services (AWS) and Microsoft Azure. Customers can use ArcGIS Server Cloud Builder on Amazon Web Services, a free desktop application, or ArcGIS Server on Microsoft Azure to quickly get ArcGIS for Server software up and running in AWS or Azure. Customers looking to automate on-premises installation using multiple GIS servers in a single site configuration, a real-time GIS configuration, or a full web GIS configuration can use ArcGIS Cookbook. Designed for users who are familiar with the Chef configuration management tool, Cookbook includes a variety of Chef recipes. It is available on the Esri GitHub repository and via Chef Supermarket.